If you are trying to update your garden there is absolutely no need to spend heaps of money, have a look at some of my ideas based on the past 6 years of gardening at my current house. Pick your plants carefully. Don't just turn up at the garden centre and grab what you like. Draw up a list of the areas of garden - sunny, shady, waterlogged and research what plants go well. I have lost many plants over the years by spending without thinking. Also, if you have children think about how robust the plant is. I spent a lot of money on beautiful alliums only for an over eager 3 year old to pull their heads off when my back was turned. Of course that's it now until next year, game over. Whereas my row of chives that produces hundreds of flowers can take a few cheeky swipes. Herbs are great doers in the garden and are tough - thyme, mint, lemon balm, lavender. Pick plants/shrubs that earn their keep, big gestures for a small amount of money like verbena bonariensis, lavatera and buddleja. 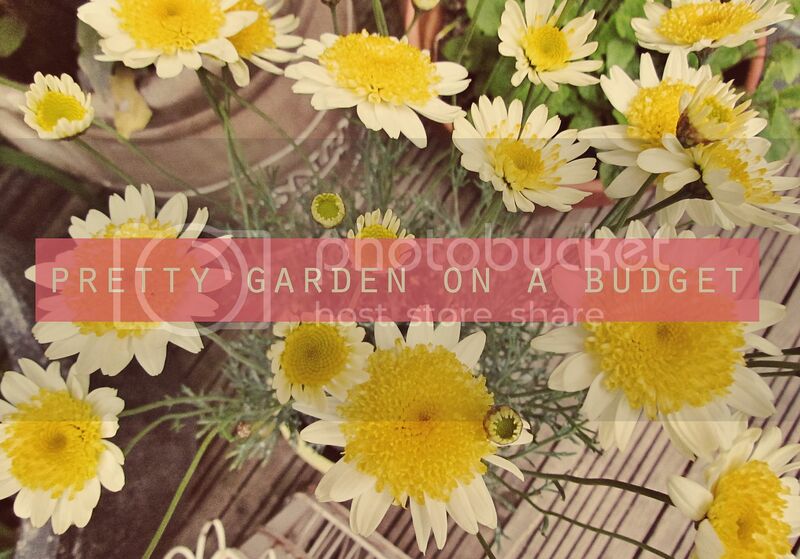 Local nurseries are a lot cheaper than the garden centres - usually 50% less. Also the pound shops have shrubs that with some tlc can do well in your borders. I bought a gooseberry from a cheap shop and with a bit of fertilizer it is in top condition now. 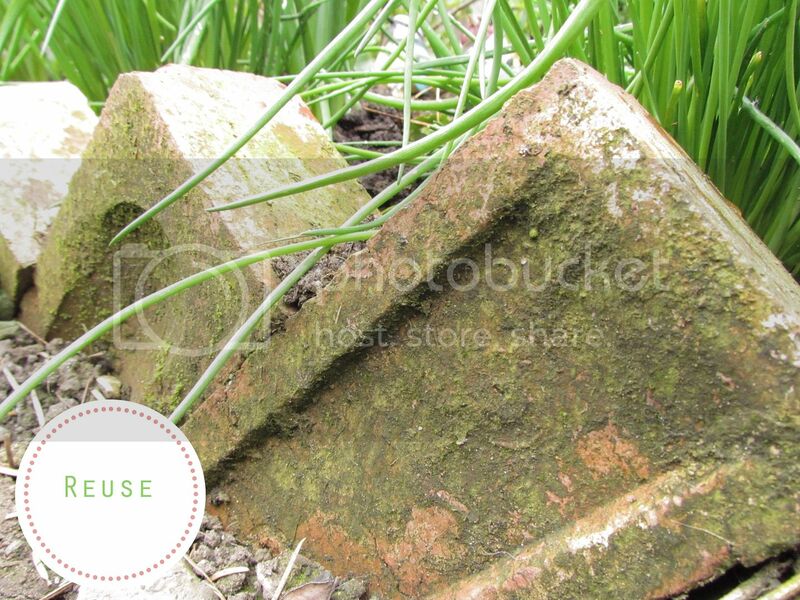 Check Freecycle for old sheds, paving stones, plants and bricks etc. You would be surprised at what people have lurking in their garden that they do not want anymore. 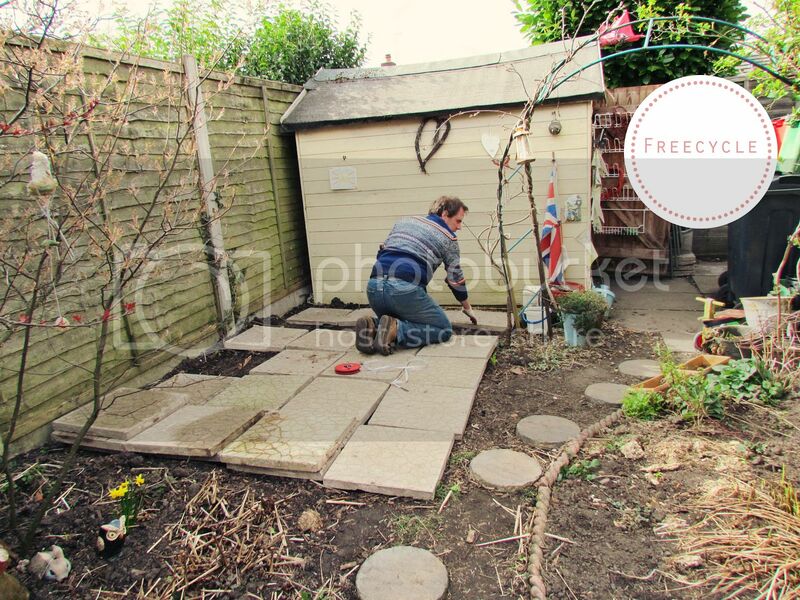 For our summerhouse I put a request onto Freecycle for paving stones. We ended up collecting 30 from a local house- this would have cost me well over £100 and for something that isn't seen like the base of a shed it's an expense I didn't want. 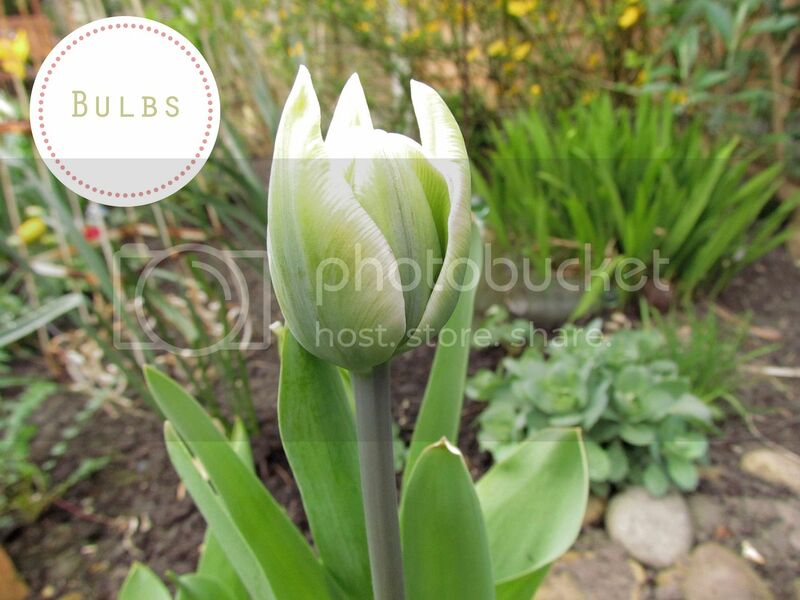 Buying seeds and bulbs are cheap ways of growing plants. Shops like Wilkinsons are brilliant for getting bargains - 99p packs of seeds and tulip bulbs. Or your local garden centres usually sell the more expensive seeds at 50% off in the autumn - that is when my dad buys all his vegetable seeds for the allotment. 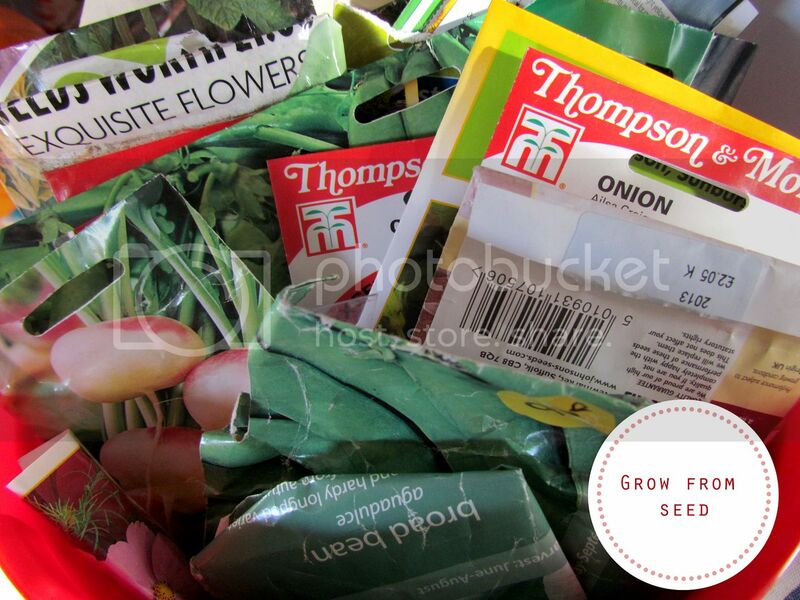 Save seed from the flowers you currently have growing too at the end of the season, keep them in little labelled envelopes ready to sow again. At garden shows, look out for seeds being given away as freebies. To grow them all in, the cheap plastic greenhouses are so handy and will last a good few years. 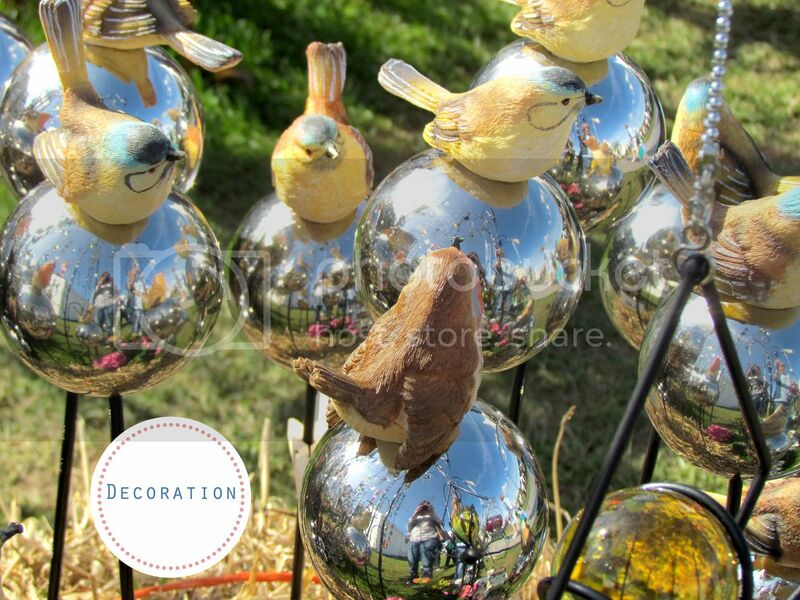 There are so many cheap and cheerful decorations to be found from solar lighting to wall art. I look to bargain shops like B&M, Quality Save and pound shops for items to liven the borders or patio up and perhaps provide structure and interest when it's winter. These types of shops are also great for cheap garden sundries like plastic pots and tools. 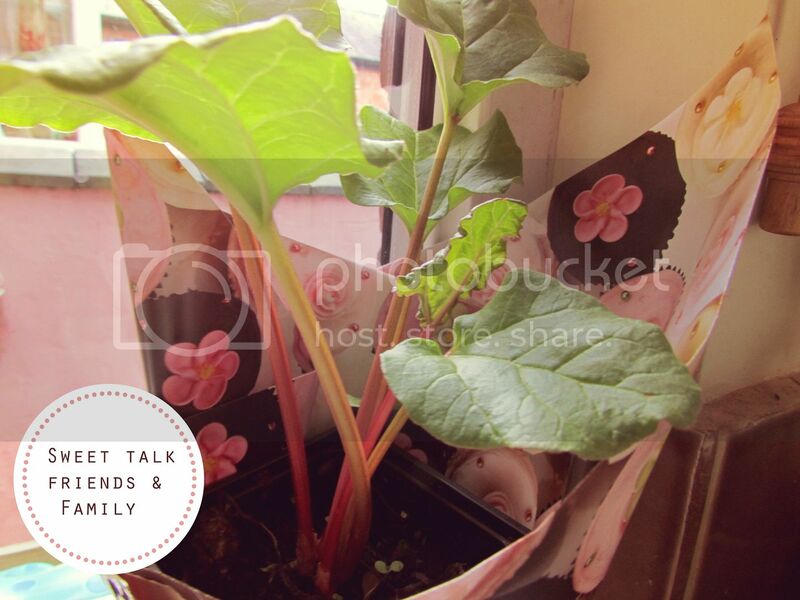 I buy cheap plastic pots and spray them or paint them with tester pots or leftover emulsion. I've currently gone yellow crazy with Plasti-kote on cheap containers. Much cheaper than the posh glazed pots and I don't have to worry about kids or dogs knocking them over and breaking them. Bunting instantly cheers up a garden and costs hardly anything if you save scraps of material. The humble jam jar with a tealights plopped into them make the most sweetest nighttime lights on your patio. Don't rush your garden. 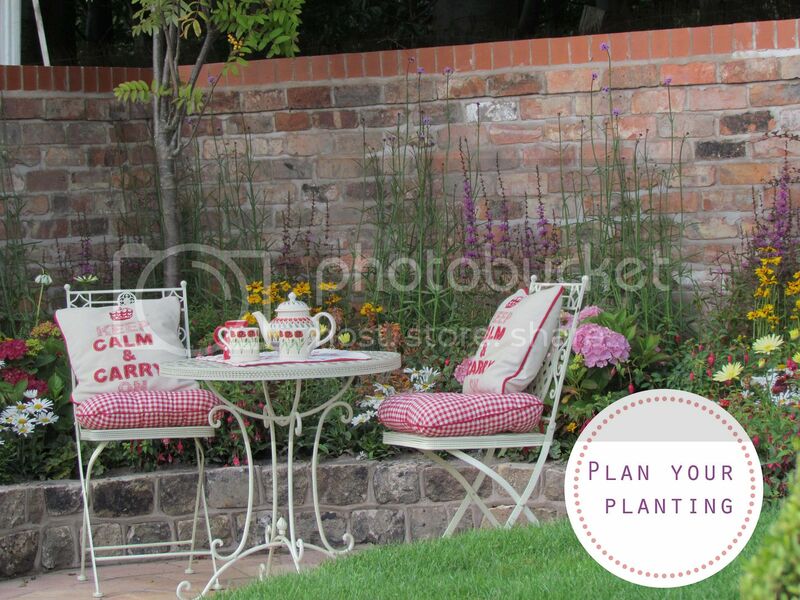 It can be tempting to want to have a Titchmarsh style makeover but give it time. You'll be amazed at how quickly gaps fill and planting too much initially leads to cramped conditions and ultimately plants dying through competition. I buy plants when I am on holiday in the UK and it's a nice reminder of where you went. My red veined sorrel in the wall container will always remind me of the sweet honest stall near Corfe Castle in Dorset. 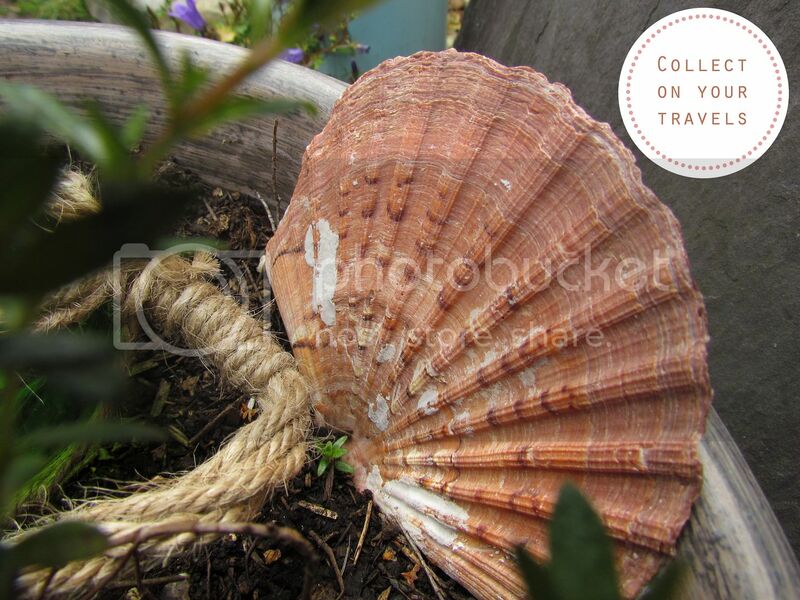 Collect shells and pebbles from the beach to decorate your garden with too. 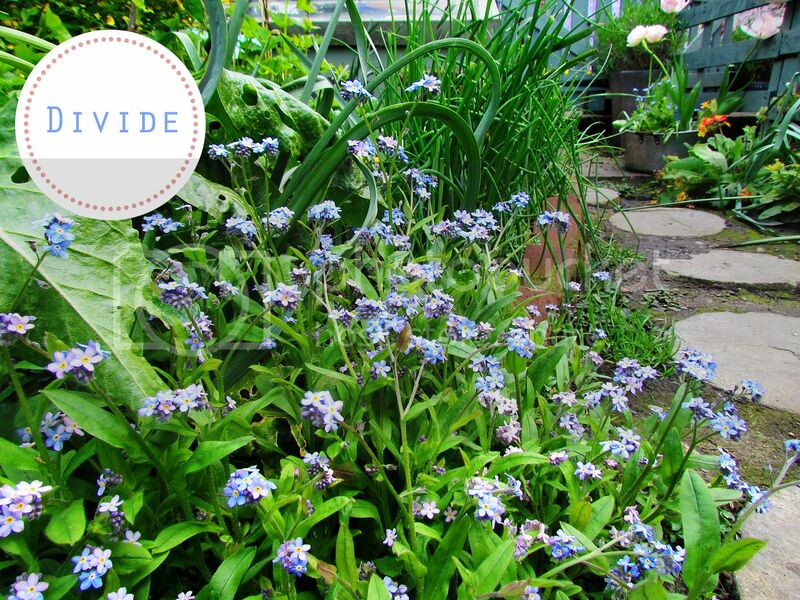 Divide up your own perennials or take cuttings. 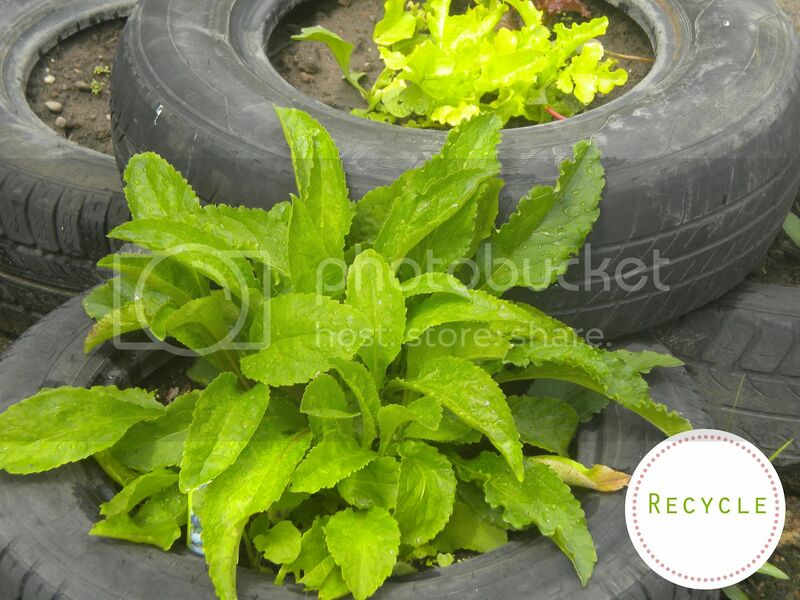 Having plants repeated throughout the garden is good design and also good for your pocket. Ask friends and family to donate any plants they have an abundance of. In our garden we have plants from our old house, both sets of parents houses and friends. It's a great way to bulk your garden up. I save all sorts to use in the garden - bits of cord and ribbon to tie plants in, lolly sticks for seed labels. I reuse plant pots time and time again for growing my seeds in. Check with your local council for composting schemes. Many sell composters at a much reduced price and of course making your own compost is a great way to create your own free soil improver. Reuse old materials you have creatively. Our small front wall that collapsed became a circular lawn edge and the edge to a kitchen garden bed too. The coping stones are now used as a feature in our side return with ferns growing around them. That saved the hiring of a small skip and has added character to the garden. 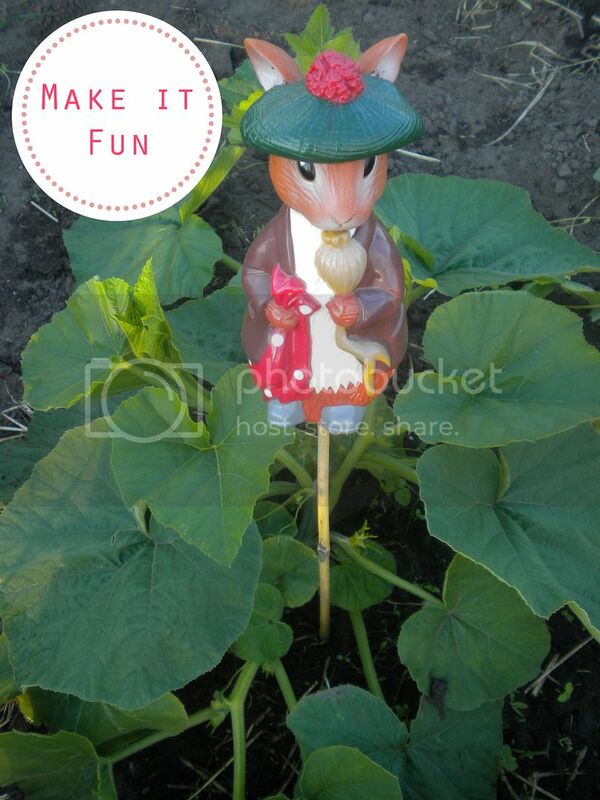 Use old wellies for petunias, sinks as herb gardens, collanders as hanging baskets. Use anything, just drill holes into the bottom for drainage and anything can be used to grow in. Pallets used as upright planters (check them out on my Pinterest board) are a great focal point or use a pallet to make a bug hotel with the kids. We have used old pallets to fence off our decking area and make a little gate which cost nothing but time. Be cheeky and ask for plants for birthdays or hope that guests turn up with the odd gift :) Enter competitions on Facebook, Twitter and on blogs - so far this year I have won several items for the garden including a cherry tree, cold frame and gnomes! For all sorts of other money saving ideas, check out the Pinching Pennies website. Great ideas, I use many of of them myself, but I've not heard of that web site. Love this post, great ideas too. It has taken 3 years for my garden to look how I want it to. My Mum, Nan and Aunts are all keen gardeners so we will swap cuttings and seeds with each other. I also have a 3 year old who likes to pick flowers -why do they always go for the expensive bulbs or the flowers that seem to take forever to grow like my big oriental poppies!!!! Plants and trees make great gifts. My Mum gave my husband a bay tree and an apple tree for his birthday. I was in Wilkinson's yesterday and noticed that they had some nice garden decorations. I bought a packet of forget me not's and love in a mist as well as a 40p packet of mixed country garden flowers. I hope you are enjoying your garden, It's lovely having the nice weather back. You have shared some great ideas. Sadly, my garden is a bit of a wasted space and is more of a football pitch and somewhere to dry clothes. Even the shed is unloved and leaning dangerously close to collapse! At my last house when I had more time for gardening (before children!) I found that buying perennials by mail order was a very economical way of making the garden look nice. I had a lovely collection of hardy geraniums in a variety of colours which didn't cost much to plant and because they were perennials they came back every year.